Windows 10 is one the most stable OS produced by Microsoft yet. Whether you are using the Windows or installing it, you will notice that errors rarely occur thanks to improved coding logarithms from Microsoft. In the past Windows operating systems used to be chastised for being heaven for errors and attracting viruses. This has largely been tamed in the new Windows 10 OS as evident from overwhelmingly positive user feedback so far according to industry reports. Only occasion when Windows 10 is considered to be most vulnerable to error is installation phase and particularly dreaded 80240020 error. Users who are most likely to receive this error message during installation are the ones who upgrade from Windows 7 and Windows 8.1 to Windows 10. As a result of this error message Windows up-gradation and installation process suffer a sudden halt. However, all is not gloomy because there is a fix available to overcome this problem and to get rid of annoying 80240020 error during installation. Remedy involves delving deep inside system registry files and folders, so extreme caution is advised. Follow the steps mentioned below in our guide with great care as a slight mistake could result in further damaging your copy of Windows or effect its compatibility withe the system hardware. Luckily process is not hard to grasp and you should be able to complete it without any difficulty if followed carefully. 1 – Go to Start > Windows System > Run or type Run in the search box. 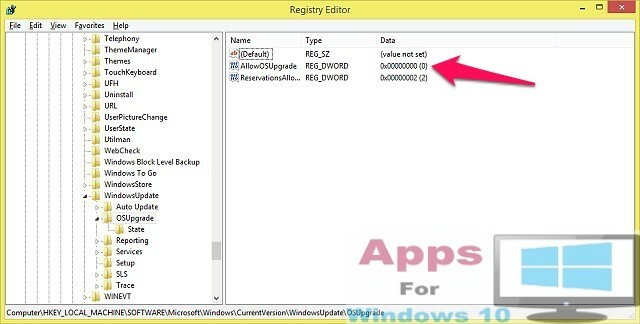 2 – Type Regedit in Run command prompt. Make sure that you run registry editor as Administrator. 3 – Now expand HKEY_LOCAL_MACHINE folder and follow the path given below, it is very important that you follow the path as it is to avoid further errors. 4 – Next open OSUpgrade sub-folder under WindowsUpdate sub-folder. 5 – Right-click on the black space on the screen in OSUpgrade folder window for creating 32-bit DWORD and rename it AllowOSUpgrade. 6 – Give AllowOSUpgrade DWORD a value of OxOOOOOOO1. 7 – Finally close the editor window and head to Control Panel to check for Windows 10 Update in Windows Update section. Download and Install the Windows 10 update. All done. Now install or upgrade to Windows 10 without worrying about the 80240020 error appearing again.